Unscrunch your memories with Selfie Station. Most photo booths cram your guests in like clowns in a tiny car at the circus. Oh look, there’s Aunt Margaret’s ear and Uncle Joe’s chin. Oh … the memories. But not anymore. Selfie Station offers squish-free photos with plenty of room for the rest of Aunt Margaret and Uncle Joe’s faces. It’s full facial fun for everyone. 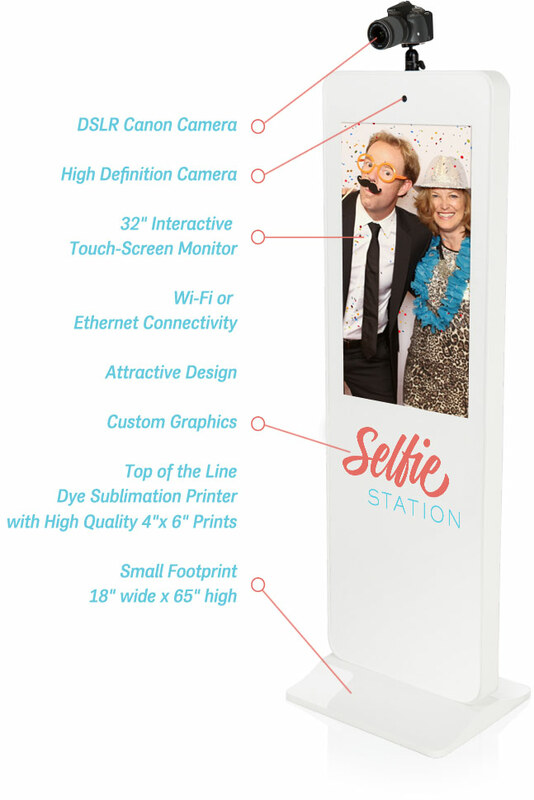 Add costumes and Selfie Station is the life of the party, breaking the ice, connecting your guests and snapping countless smiles for precious keepsakes. Add fun props after you take your photos. Take your photo, then add your own art. Write on! Add a clever caption to your photos. Add a palm tree, beach or other scenery in post-production. Add and subtract features for your event and multiply the fun. The Selfie Station has taken our outdoor events to the next level by offering sponsorship opportunities to our clients that represent their brands beautifully. With 10K-plus crowds, the Seflie Station has kept up every step of the way.